Fujitsu just unveiled a few futuristic concept gadgets, the most interesting of which is probably a fabric laptop. Sure, there's no word on just how they'll make a computer that's "soft, pliable, and can comfortably be carried like portfolio of paper," but it sure is a neat idea. The other concepts are an electronic card viewer, a salesclerk browser, and a customer browser. Check out the gallery below for big images and hit the jump for the official release. Card Viewer - An information device which consists of a main part and two or more "electronic paper" sleeves which are detachable. These can be used for sharing data, information, directions, etc... Simply detach a display and hand it to a friend or colleague. The information stays on the screen. Clerk Browser - An information terminal which a salesclerk uses in stores, like a boutique, super store, car dealership, etc... It attaches to the wrist and is used to provide information to help customers. Product information like bridal registries, inventory levels, specifications, product locations; and customer data like buying patterns, other products customers buy, recommendations if product is out of stock. Fabric PC - Based on the concept of electronic paper, this PC supports varying usage models due to the flexibility provided by the display. 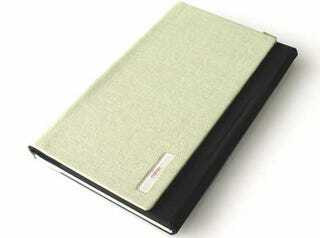 The unit is soft, pliable, and can comfortably be carried like portfolio of paper. Yet it is a fully functional PC that can be used as a notebook, notepad, address book and digital map.